Bret Harte kid with Mother and Brother harvest onion, originally uploaded by Museum of Science and Industry's Smart Home Garden. 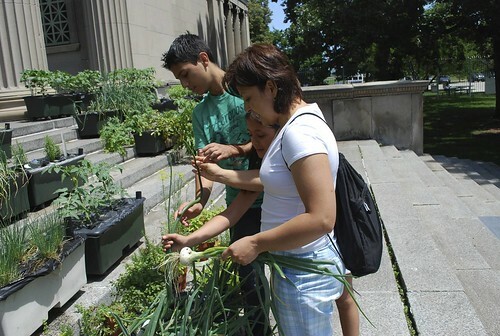 It's unlikely that many would think of planting a vegetable garden on the steps at the entrance to a museum, but it is a reality. This is the EarthBox garden at the entrance to the Museum of Science and Industry in Chicago. It is adjacent to the Smart Home that also has an EarthBox Garden. Portability of these planters makes outreach possible. If this was a PONG, this family could not only take some vegetables home, they could take an EarthBox garden as well. Obviously some administrative details would have to be worked out, but if could be done. It's a matter of policy rather than technology. The potential of PONGs (prior posts) to help eradicate center city food deserts is enormous. Sub-irrigated Planters(SIPs) - Boxes, Beds or Buckets - Grow fast, grow good, save water, save time, eat clean...go green! Who would think of growing fresh vegetables here? Everywhere I look, I see sites for PONGs. This could be your neighborhood. Have a look around with a PONG awareness. There could be a new PONG started every day in America. It is not an over-ambitious goal. All it takes is education and the will to do it. It is not a question of money. Ping us if you are interested in starting a PONG. The Center for Urban Greenscaping (CuGreen) helped launch a new type of edible school garden this week. It is a beta version of the Portable Outreach Neighborhood Gardens (PONGs) advocated by CuGreen. This particular PONG project is in partnership with PS 102, Bay View School in Bay Ridge, Brooklyn. Principal Theresa Dovi heads the school located at 211 72nd Street, Brooklyn, NY 11209. The garden is on 72nd Street between Ridge Boulevard and 3rd Avenue. See map. CuGreen is strongly advocating a new 21st century form of neighborhood and school garden based on portable sub-irrigated (aka self-watering) planters (SIPS). They may be locally made boxes, beds and buckets or consumer products such as the popular EarthBox. The initial beta plantings in this PONG are in bucket SIPs. Other planter types will be added later this year. All offer the benefit of portability, which makes outreach to the surrounding community possible. The school’s team including Parent Coordinator Margaret Sheri, Custodial Engineer Marco Samponara and parents Didem Meadows and Rana Abu-Sbaih met on Monday to install heirloom tomatoes and bell peppers in the fenced in garden behind the school. Portable sub-irrigated planters (SIPs) will produce more fresh food per square foot than any other method while using less water and time. Unlike in-ground gardens or beds, they can be moved around at will during the growing season. Further, there is no need to fear contaminated city soil. It is an unfortunate reality of urban life solved by using SIPs. SIP gardening is the most flexible and productive form of urban gardening. A PONG can be easily reconfigured depending on the particular crop and seasonal sun availability. A PONG does not need access to tillable earth. Sunny black top and concrete spaces will work just fine. There is no need for heavy labor or construction. Portability is the key to outreach, an innovative feature of a PONG. At the end of the school year, some students may take a SIP home with them to nurture over the summer. Student education will continue with this experience. They can also share what they learn with siblings and other family members of all generations. Of course, they will also share some delicious fresh vegetables. Outreach is about inclusion rather than exclusion. No one needs to be an experienced gardener, farmer or dirt devotee. Anyone (young or old) with access to six or more hours of sunlit space and the ability to follow simple instructions can grow fresh food in the city. Nature teaches in many ways, including through science and technology. Portable SIPs provide the means to follow the scientific method. Due to some unforeseen circumstances the garden got a late start this season. It will officially launch in September when school reopens. In the coming weeks we will consider planting some fall vegetables and flowers. Parent Coordinator Margaret Sheri is forming a garden club at the school and the PONG will be a center of its activities. It is possible that the schools autumn festival will feature some school grown pumpkins and gourds grown in larger size SIPs. That surely will be a treat for the schools students, teachers and parents. There is much more to come. Stay tuned! Thanks to Nicholas we have a great photo set of his homemade sub-irrigated (aka self-watering) tote box planters. Cool deck! Using the design for an "earthtainer" I set up a garden for tomatos on my back deck, cost was about $35/box but most of that cost is initial setup, and next year will be reduced to about $20. They use roughly 40% less water than a typical garden so they're very eco friendly, overall they have grown so quickly I need to build a better support system for the biggest ones. The two biggest ones were planted May 3rd. These vegetables are growing in Sierra Madre, California. Using sub-irrigated planters like the EarthBox they could be growing on any sun-lit paved surface in any city in the world. They work just as well in inner city neighborhoods as the suburbs with yards. Well done geekhunter! Thanks for posting the pics! See the rest of the album. This video from Good Morning America features Wendy Bounds, author of the Wall Street Journal article For a Green Thumb, Just Add Water. Wendy may not have known about modern urban gardening before this, but she obviously gets it now. Her footrest is an EarthBox. It was good to see a top national newspaper like the Wall Street Journal give this subject the attention it deserves. Kudos to ABC as well. Slowly, but surely we're getting past our retrogressive institutions. Before too long they will have no choice but to follow. Summer starts this weekend, and already I'm munching on home-grown Swiss chard, three varieties of lettuce, arugula, mint, chives, oregano, sage and basil. The potatoes are planted; so are tomatoes, peppers and some broccoli. And here's the clincher: It's all growing on my deck. Consider me a lawn-chair gardener. After years of putting off starting a food garden because I could never find time to till the soil, erect a deer fence, weed, water, etc., I finally took the plunge thanks to an arsenal of easy-gardening products now flooding the marketplace. From container kits with premeasured fertilizer and watering gauges to compact potato and lettuce-growing bags that can be toted around, the gardening industry is angling to green the thumbs of reticent, and younger, first-time growers. The new items are intended to save time, water, fertilizer and space -- and make it hard to mess up. Sub-irrigation: Bloggers are Getting it! It was good to see Mr. Brown Thumb, long time garden forum participant and blogger recognize that sub-irrigated (aka self-watering) planters like the EarthBox are "the new black". I much prefer "the new green". Picky, picky! MBT is now the garden blogger for the new Chicago Tribune blog venue. We desperately need more gardening bloggers and writers who don’t have their heads stuck in a drain hole. This looks likes it can be a successful offering from the beleaguered mainstream media. Tomato Late Blight, Phythophora, Water Mold Anyone! A strain of the fungus, Phytophthora infestans, causes late blight in tomatoes. As the common name implies, Phytophthora is prevalent on tomato hosts in late summer, after the plants have bloomed. Late blight is more common in north central and northeastern states, but is observed in the Midwest when the humidity is high and temperatures are around 68 degrees F late in the growing season. Watch for the disease when cool, moist nights are followed by warm, humid days. There are many reports of "late blight" or Phythophora hitting tomato plants in the northeast. Phythophora is a water mold that we occasionally dealt with back in my days in the interior plantscaping business. It was almost always associated with a watering problem, as in too much. If you're in the northeast you know what a wet and cloudy spring we have had. Phythophora is no surprise to me. Has anyone been hit with this problem? Please share your experience. See an excellent series of photographs and read about the progress of Graciela's EarthBox (prior posts) garden here. Nice work! Check out the lush vegetable plants in Bucolic Bushwick's rooftop garden. I look at a lot of vegetables growing in containers every day. I hardly ever see top watered plants in drain hole pots that look this healthy. Feeding water by capillary action in sub-irrigated (aka self-watering) planters makes a major difference. Forget about that drain hole stuff. It's simply an urban legend...urban mythology. No need to take anyone's word for it. You can easily prove it to yourself.